PLANTING: Plant seed or transplants in the spring. Seed can be started in the winter indoors and set out after the last frost. BLOOM/FRUIT: Small heads of tiny pink or white flowers followed by small tan aromatic seed with tiny bristles. GROWTH HABITS/CULTURE: Short growing annual that’s easy to grow from seed. Grass-like leaves, but often look droopy. Likes hot, dry summers for the best seeds. Grows best in well-prepared and well- drained soils. Use lots of compost and volcanic sand. PROBLEMS: Rain can ruin the seed harvest. Plants usually need protection for winds. HARVEST/STORAGE: Harvest seed as they mature and store in a dry place in glass. CULINARY USES: Cumin is primarily grown for its seed. Use to season chili, meats, breads and vegetable dishes. Mexican cuisine herb. Stems are used to flavor Vietnamese and Cajun dishes. MEDICINAL USES: According to Lesley Bremness in her book Herbs, the oil is used for massages to reduce cellulite. The crushed seeds aid digestion, relieve flatulence, colic and diarrhea. Take as a tea. OTHER USES: Cumin is included in some veterinary medicines. INSIGHT: Cumin is one of the “Bible Herbs”. 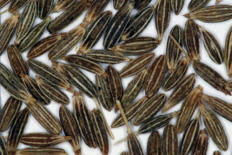 Cumin (Cuminum cyminum) grows to approximately 20" in ideal conditions, with white or pink flowers in summer. It needs a long growing season, so for best results start indoors in organic potting soil about 4 weeks prior to the last frost in the spring. Sow seeds approximately 1/4" beneath the surface of the soil. Keep moist once seeds start to germinate. Plant the seedlings outside when risk of frost is gone. Cumin needs full sun and a long growing season. It tolerates a fairly wide range of soil types, but will do best in well-prepared and well-drained healthy soil. Just in case this is your interest, Cumin is not the same as Curcumin. Cumin is a spice that comes from seeds atop a plant somewhat related to parsley. Curcumin is a component of the spice Tumeric or Turmeric, which is ground from the root. Turmeric, known officially as Curcuma longa or domestica and historically as Indian saffron, is a rhizome of the ginger family. It has little taste and is used to give yellow color to curry dishes. It is used medicinally as an antioxidant to treat cancer, skin problems and arthritis. Turmeric is tropical and grown from rhizomes. Cumin is a highly flavorful and aromatic spice. It is sometimes used in curry powder blends and in Mexican and Middle Eastern cooking. Cumin or Jeera is reported to boost the immune system and help with digestive disorders, high blood pressure and weight loss.